Shahi paneer, as the name suggests is a royal curry with paneer cooked in a rich and creamy gravy with cashews, cream and tomato. Onions and tomatoes are cooked with whole spices in butter and ground to a smooth gravy, which is again cooked in butter with cream and cashew paste. 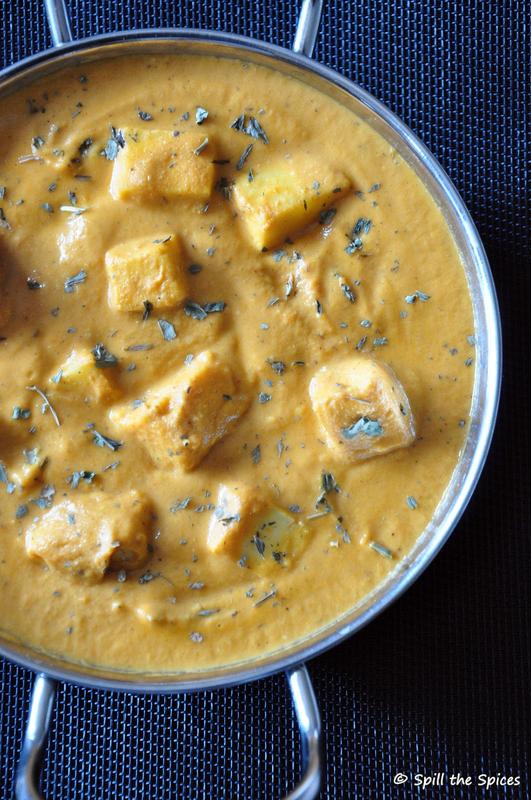 Lastly paneer is simmered in this rich and thick gravy. Though most of the ingredients going into shahi paneer and paneer butter masala are similar, it does taste a wee different. 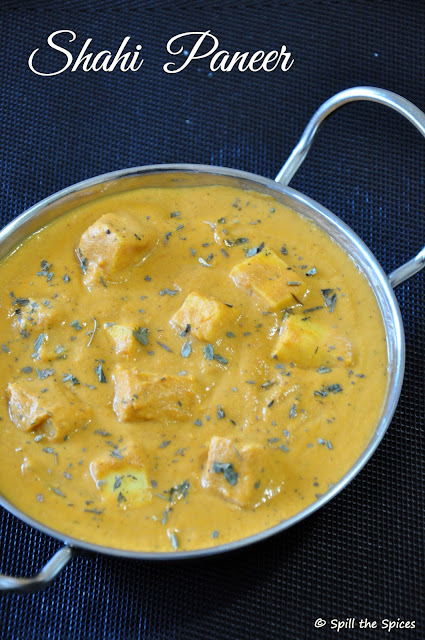 Butter naan or jeera pulao would make an excellent combo with this shahi paneer. You can also serve with roti or any mildly spiced pulao. Let's see how to make this royal North Indian dish. 1. Soak cashews in hot milk for 10 minutes. Grind to a smooth paste and set aside. 2. Heat 1.5 tbsp oil and 2 tsp butter in a pan. Add bay leaf, cardamom, clove, cinnamon, peppercorn and fry for 30 seconds. 3. Add onions, little salt and fry till the onions turn light brown. Then add ginger-garlic and fry till raw smell goes. 4. Now add turmeric powder, cumin powder, coriander powder, red chilly powder and fry till raw smell of masala goes. 5. Then add tomatoes, tomato paste, sugar and salt. Mix and cook the tomatoes for 7 to 8 minutes. Remove from heat and allow to cool. 6. Once it is cooled, grind the onion-tomato mixture with curd to a smooth paste. 7. Heat pan and add rest of oil and butter. Add the ground paste, cashew paste and 1/2 cup water and mix well. Cook for 4-5 minutes. 8. Then add cream, garam masala, kasuri methi and cook for 1-2 minutes. Then add paneer and simmer in the gravy for 5-6 minutes. Serve hot with naan or pulao. 1. Make sure the gravy is smooth after grinding. You can strain the gravy after grinding to ensure its smooth. 2. Add extra cream if you want a more richer gravy. 3. You can substitute tomato paste with tomato puree. 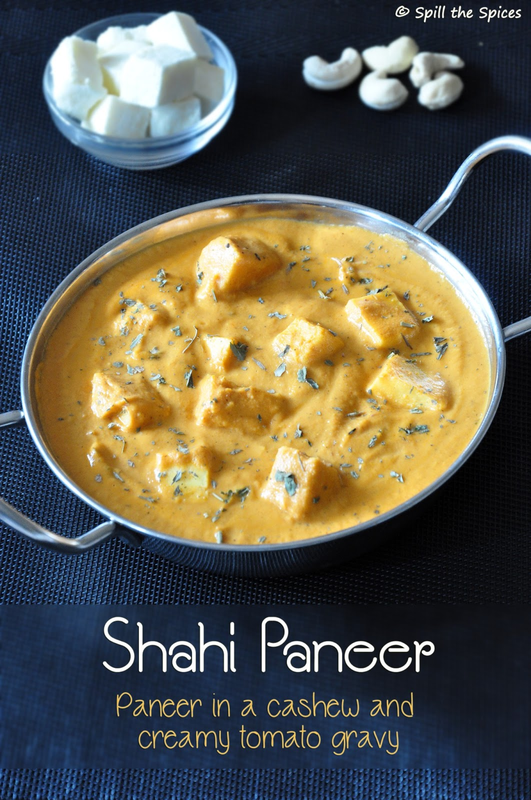 love tis creamy yummy one.. any time with roti..
Shahi paneer looks creamy, delicious and inviting. Nice clicks too.. Simply mouthwatering and delicious curry with lovely clicks. i am literally addicted to these rich creamy gravies, Sona. bookmarking this recipe. Alwayas wanted to make it myself, but have never done...you are really inspiring me to make this for sure..
really it is shahi dish with all the masalas and ingredients are in. I love paneer dishes they make the meal really special. Shahi Paneer looks so delectable and rich. Love the colour of the shahi paneer,seriously makes me drool..
Beautiful outcome, that thick gravy in which paneer is drenched. I see a big variety of spices for the curry and yes, Its really good. Very interesting nice dish..loving shahi paneer.Looks creamy and rich. Such beautiful photos and my favourite dish, too! Hi! Your shahi paneer recipe was nominated as one of the "Best Shahi Paneer Recipes on the Net". To vote for it, please visit http://easyindianrecipes.org/side-dish-recipes/best-shahi-paneer-recipes-on-the-net-vote-for-your-favorite/ - your recipe is positioned at #95 (random order).